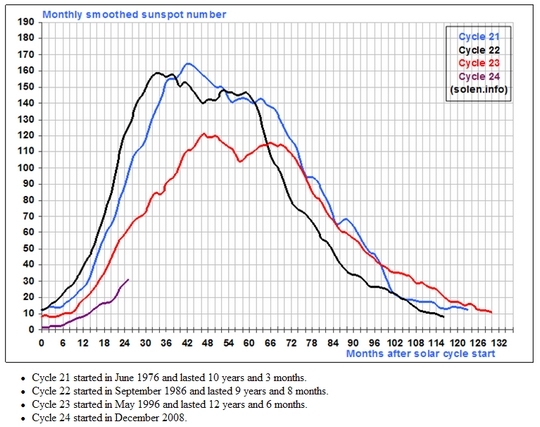 Solar activity rose this week, with the average daily sunspot number rising more than 40 points to 66 points, while the average daily solar flux rose more than 13 points to 101.9. Sunspot numbers for August 18-24 were 53, 46, 59, 66, 82, 81 and 75, with a mean of 66. The 10.7 cm flux was 97.8, 98.2, 100.5, 100.9, 108.2, 103.7 and 104.1, with a mean of 101.9. The estimated planetary A indices were 3, 2, 5, 3, 7, 9 and 6, with a mean of 5. The estimated mid-latitude A indices were 1, 1, 4, 3, 5, 8, and 5, with a mean of 3.9. The predicted solar flux for August 26 is 110, rising to 115 for August 27-28, 110 for August 29 to September 1, 105 for September 2-3, 100 for September 4-5, 95 on September 6-7 and bottoming out at 90 on September 8-12. The next peak of activity is predicted for September 22-23. The predicted planetary A index is 5 for August 26-27, 10 on August 28, 8 on August 29, and 5 on August 30-September 2, then 8 on September 3, 10 on September 4-6, 7 on September 7, and 5 on September 8-10. Geophysical Institute Prague predicts quiet conditions for August 26, unsettled on August 27-28, quiet to unsettled August 29 and quiet conditions on August 30 through September 1. A story forwarded by a reader from a British newspaper warned that “a huge mass of electrically charged particles thrown out by a giant eruption on the sun is due to strike the earth tonight.” But the article itself is undated, and the web page continuously updates to show the current date. The link to the article was sent to me on August 21, but the event didn’t happen then, is not happening now, nor is such an event predicted for the next few days. Down the left margin of the page are ads for astrologers, and on the right margin are links to over 80 stories about celebrity gossip. If you do a web search for phrases from the article, you find it quoted all over the net by people assuming that this is about to happen, some of them quite alarmed. But looking at the latest prediction from NOAA/USAF shows no predicted rise in the A index, which would be large if such an event were predicted. So what date was the article published? I doubt if this newspaper has had a science editor for a number of years, so perhaps they keep running the same article with its dire warnings, while only the celebrity gossip changes. The key to the date of this article lies in searching the newspaper archive for the headline. If you enter a portion of the headline into the search box next to the article, the actual date is revealed: October 29, 2003. This is nearly eight years ago! Now we know why nobody predicted this event. In these fast moving times, 2003 might seem to some like ancient history. Try doing a web search of a phrase from this article. Some of the results are quite funny. You will see it referenced all over the web as if it just happened and were breaking news.